The terror attack in Paris has been acknowledged by the Islamic State, amidst threats of more such attacks. While the internet has stood up to show solidarity for the Paris attacks, one pianist paid the most unique of tributes to the Paris attacks. 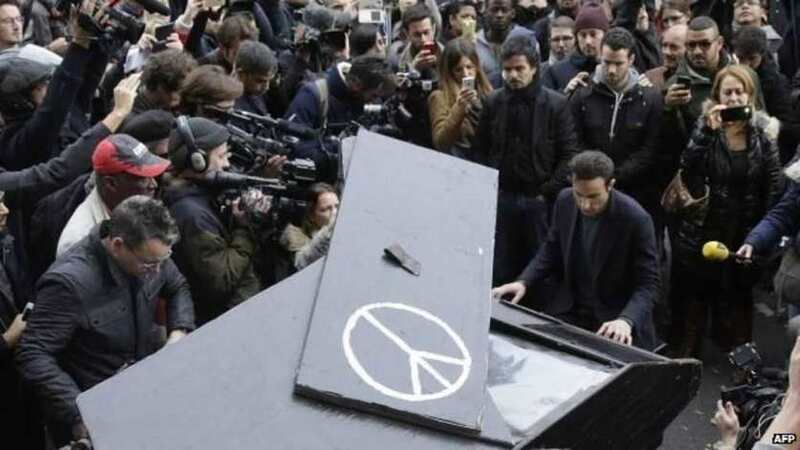 Early the next morning, a pianist was seen playing John Lennon’s ‘Imagine’ on his piano outside the Bataclan stadium where one of the blasts took place. By the end of the song, the pianist is seen wiping away tears and leaving the scene. While the internet was raving about the person, it has been revealed that the pianist was David Martello. He told reporters that he was in Germany when the attacks happened, and immediately rushed to France, hauling his piano into his trailer. This wasn’t the first time the 34 year old Martello was paying a tribute to the deceased. He had also paid a tearful farewell after the Charlie Hebdo shootings. On Saturday, he chose John Lennon’s iconic song ‘Imagine’. ‘Imagine’ was written by Lennon and questions the use of religion, wealth, possessions and borders, and asks you to imagine a world without all of this. It’s difficult. But it’s not impossible.